Meta, Maxine, Madelaine, Matt and Tracy are going back to the eighties this week; November 1989 to be precise. Why? Wote Street is celebrating their 25th anniversary on 28th November…so join our nostalgia ride. This Friday, (28th November) our office will be transformed into a 1980’s office meaning the fax will be dusted off and the computers will go away (email and internet will be banished between 10am and 3pm). No smoking signs will be replaced with ash trays, hair will get bigger, as will our shoulders. Watch out for our tweets throughout the day…or please pop in and have a glass of bubbly with us. But first, we are going back to …. Thank Crunchie it’s Friday! 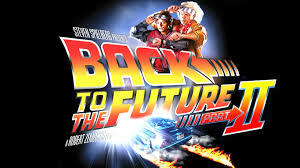 Here at Wote Street Employment Bureau we’re looking forward to going ‘back to the future’ tonight as we all head off to Basingstoke’s ABC cinema to see Micheal J Fox in Back to the Future II. Can’t believe it’s been four years since we first met Marty Mcfly and The Doc – how the eighties are flying by! Hopefully there will be time for a quick Tia Maria and Coke in the Feather’s before we head off and because it’s Friday night, I’m sure Meta and Maxine will want to strut their stuff later, at Martines.